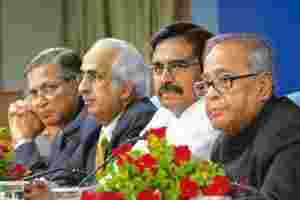 New Delhi: Finance minister Pranab Mukherjee said on Tuesday the government had no plans for a hasty exit from its Rs1.86 trillion fiscal stimulus package while reiterating its commitment to return to a path of prudence when the economy allows it to do so. “For the present, I maintain that the fiscal stimulus will have to continue to allow its impact to fully run through the economy," he said at the annual economic editors’ conference. “It is, however, an imperative to come back to the path of fiscal prudence as soon as the current economic circumstances permit us to do so," the minister added. The government’s fiscal stimulus package was aimed at cushioning the economy against the global financial crisis. The economic policy overview Mukherjee provided at the conference indicated the government was unlikely to make significant changes in the next four months. In response to a question on the government’s options to deal with the macroeconomic fallout of a renewed increase in foreign capital inflows, Mukherjee said: “I am not going to put any curbs on capital inflows right now." Policy on the macroeconomic front would change before the budget in February, given that RBI has begun to roll back its accomodative monetary policy, said N.R. Bhanumurthy, a professor at New Delhi-based economic think tank, National Institute of Public Finance and Policy. Even if the fiscal side remained static, the economy would feel the impact of RBI’s decisions, he said. “There is no status quo in government economic policy at present apart from the public expenditure side. Indicative tightening of monetary policy has already started and disinvestment process is also on," Bhanumurthy said. Concerns have been rife over the government’s fiscal deficit, which this year is projected at Rs4.51 trillion, making up 6.8% of gross domestic product. The telecom ministry’s proposed auction of 3G spectrum is estimated to yield a revenue of Rs35,000 crore this fiscal, helping cover the deficit partly. In the last days of the United Progressive Alliance’s first term, according to a memorandum of understanding (MoU) between the ministries of defence and communication, defence forces were to gradually vacate some spectrum to facilitate the auction. “I do hope a decision will be taken according to the letter and spirit of the MoU," Mukherjee said.